Hershey Felder: Beethoven is mesmerizing — you can’t take your eyes or ears off Hershey Felder! Nothing tops a standing ovation and this production must be on the top of your “must see” list. It’s one of the greatest musical productions of the decade. 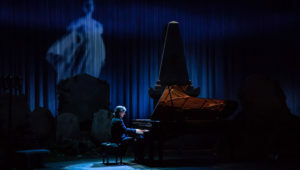 Hershey Felder returns to The W allis, bringing Ludwig van Beethoven to life through the eyes of a Viennese doctor who spent his boyhood by the Maestro’s side. Poignantly directed by Joel Zwick, this new production is based on the original Aus dem Schwarzspanierhaus by Dr. Gerhard von Breuning. With text by Felder, Hershey Felder: Beethoven features some of the composer’s most famous works including the Moonlight Sonata, Pathetique Sonata, selections from the 5th and 9th Symphonies, Hershey Felder: Beethoven is a journey through time that will bring you closer to the essence of a genius. The direction by Joel Zwick, who directed “My Big Fat Greek Wedding,” is a perfect collaboration with Felder — as any great production requires a meshing of the performer and director. One of Felder’s lines, “Beethoven created love where it didn’t exist,” with Zwick’s direction, evokes a poignancy on a visceral level. Felder created the scenic design and the brilliant use of light, executed by Christopher Ash of Lighting & Projection Design. Especially beautiful is the way they illuminate an aberration when Beethoven creates a beautiful angelic virgin Goddess. The story of Beethoven’s life is told through the eyes of the son of his childhood best friend. Beethoven’s life was filled with pain and joy. Felder takes the audience on a journey through his moments of utter joy that surpasses anything mere mortals experience. What is deeply moving about this production is the intensity in which Felder feels the role. He emanates the genius of Beethoven intimately and profoundly and moves one to tears. Hershey plays both Beethoven and Dr. Stephan Von Breuning. Hershey describes his body of work as theatrical impressionism and attributes the show’s success to the tremendous popularity of what he considers the world’s greatest composer. This extraordinary one-man musical play at the Wallis Annenberg Center for the Performing Arts is extended through Sunday, August 19 due to popular demand.